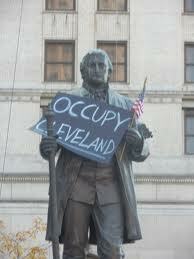 CINCINNATI (TDB) -- Ohio Daily Blog reports that Cleveland's Council has ordered copies of a resolution supporting the Occupy movement be sent to President Obama and all members of Congress. The resoultion was adopted last night. A link to the Occupy Cleveland website is available here, and the protesters are on the public square hoping to get electric for their tents before they "freeze their asses off" as a recent bulletin from the site said. Unlike Cincinnati, where police forced the occupiers out of Piatt Park, the Clevelanders remain entrenched and appear quite active. Cleveland Councilman Brian Cummins, who pushed the resolution through, had been a Democrat until 2010, when he switched to the Green Party, which has only a handful of officeholders in Ohio. Cummins was a banker at National City, then worked for the Peace Corps. Cleveland has been hard hit by the loss of manufacturing jobs, foreclosures and the banking crisis. About 82,000 unemployed people live in the 3-county Cleveland metro area where the jobless rate has been hovering around 8 percent. With the resolution's passage, there is unlikely to be mass arrests or pepper spraying on the protesters in downtown Cleveland -- where one of the nation's largest banks, National City -- was squeezed out of business during the Great Recession. National City, which had purchased Cincinnati's Provident Bank during the boom years leading up to the 2008 crash, became part of PNC in a forced merger that cost Cleveland jobs. The loss of the bank's corporate headquarters in downtown Cleveland is seen by many in Northern Ohio as a symbol or corporate excess. As for the support Occupy resolution, it cites economic and political reasons for the protests: ". . . the economic roots of these protests are varied, including sustained unemployment, growing income disparity, banking system failures, stalled earning power, and unjust tax systems, that all contribute to ongoing wealth disparities." The resolution adds, ". . . the political roots of these protests are also varied, including the growing political power of corporations, influence of money on elections and public policy and inability of average citizens to have their voices heard and needs met through formal political forums, thus contributing to citizens pursuing alternative political arenas." Cummins has a blog, and the link is here.